The origins of Barcelona are attributed to a few legends. One says the city was founded by the mythological Hercules 400 years before Rome, while another claims that in the 3rd century BC, the father of Hannibal named the city Barcino after his family. However, we know that in 15 BC it was made a Roman military camp and colony with surviving ruins that provide evidence of their time there so it is generally accepted that it was founded as a Roman city. Of course, along came the Visigoths who made it their capital followed by the Arabs and that confused the city's lineage somewhat. Eventually it became a zone ruled by the Count of Barcelona and over the ensuing centuries political marriages helped unite territories giving it an intricate cultural heritage but then followed a great plague and wars that devastated the region. Today, Barcelona is the second largest city in Spain, a proud survivor of tumultuous times that has eventually prospered and burgeoned into an artistic mecca with both advanced architecture and imaginative, succulent food. 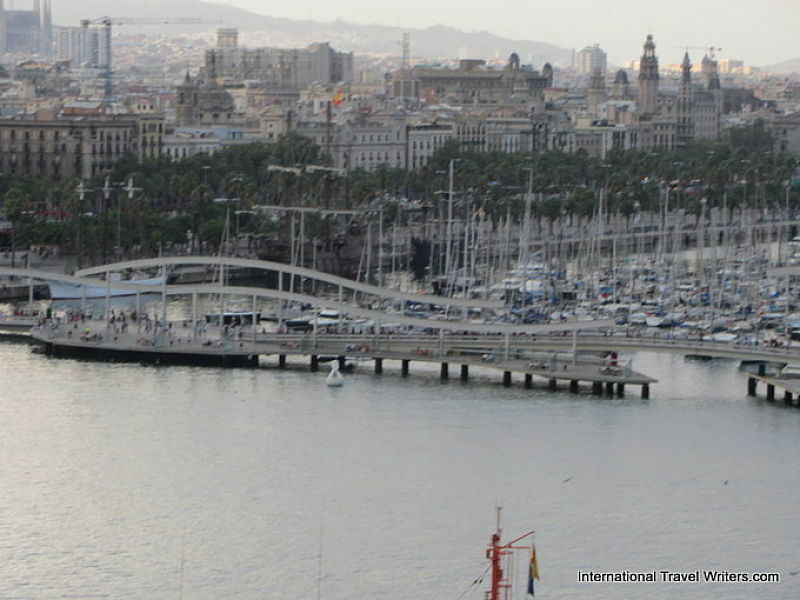 Both of our visits to Barcelona have been while on cruises. They have a very modern and inviting port. 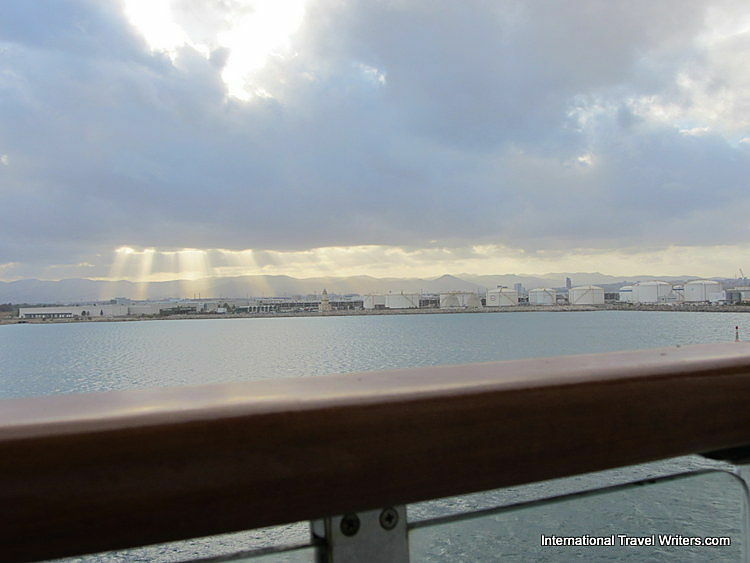 Our first visit was at the end of a cruise where we only had one day and the next time was prior to embarking so we deliberately planned a couple of days in the city first. 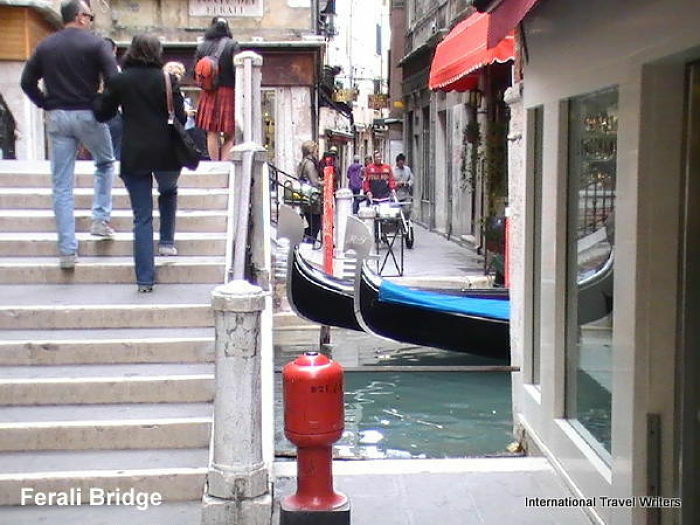 This city has such a collection of sights and an ever-changing flair for modern blending with the medieval that it makes for a heady mixture that will captivate you. Each time we have stayed at the Eurostar's Grand Marina Hotel which is near the cruise port and actually integrated into the World Trade Center complex. It is so unique and special that there is a separate article to read if you click on the link. However, in the photo above, is the Hotel Vela (Sail Hotel) named for it's sail shape. 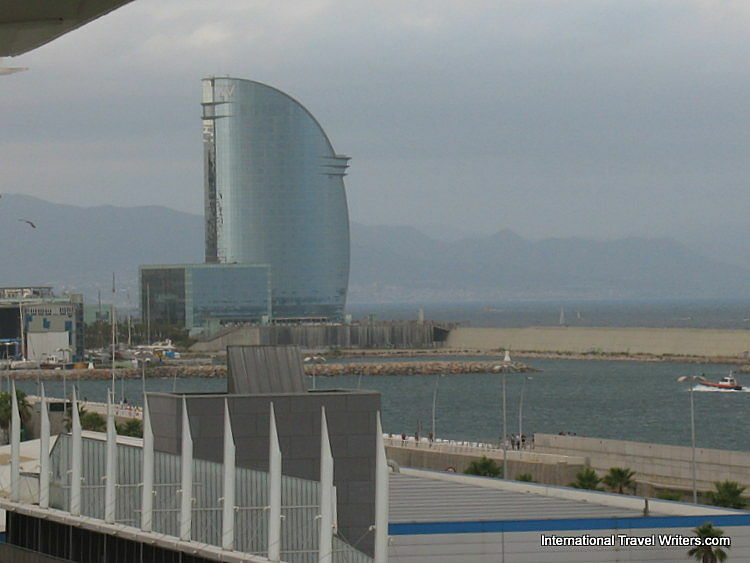 It is located in the Barceloneta district where all the beaches are but is still visible from the cruise terminal where we took the shot. The remarkable works of Antoni Gaudi can be viewed throughout the city but his Sagrada Familia was visible from our hotel room and you can see the spires towering over the surrounding edifices. It has been under construction since 1882 and is not slated to be complete until 2026. Wow! Port Vell was opened in 1995 and it integrates business and retail centers with wide walking areas for visitors to enjoy the area. 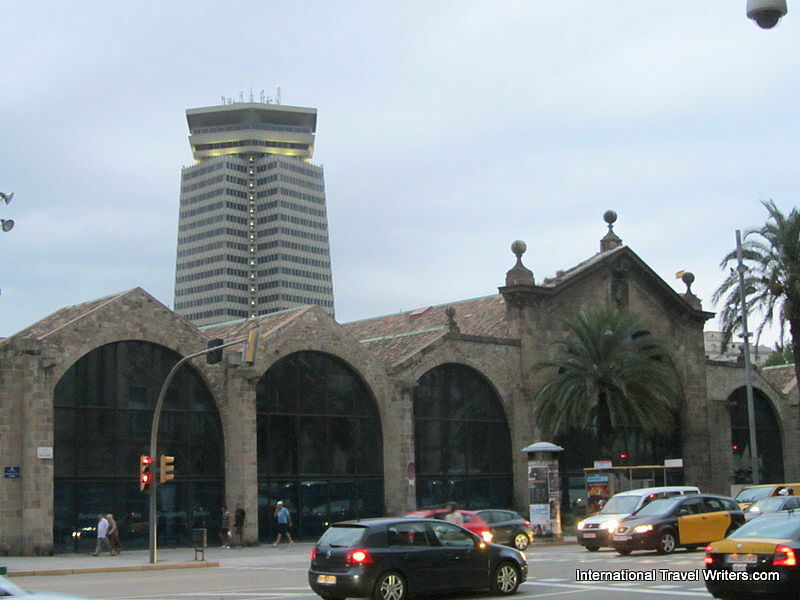 The T3 PORTBUS shuttle takes cruise passengers from Plaza de Colon in central Barcelona to Terminals A, B, C, and D on the Adossat wharf. 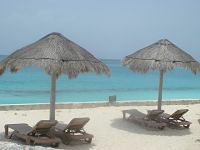 For those with vehicles there is long term parking with special rates for cruisers at 75 Euros for 11 days. Portal de la Pau (part of the Plaza de Colon) displays the Christopher Columbus Monument at the lower end of La Rambla. It is a massive 197 feet tall including the 24 foot bronze replica of Columbus. 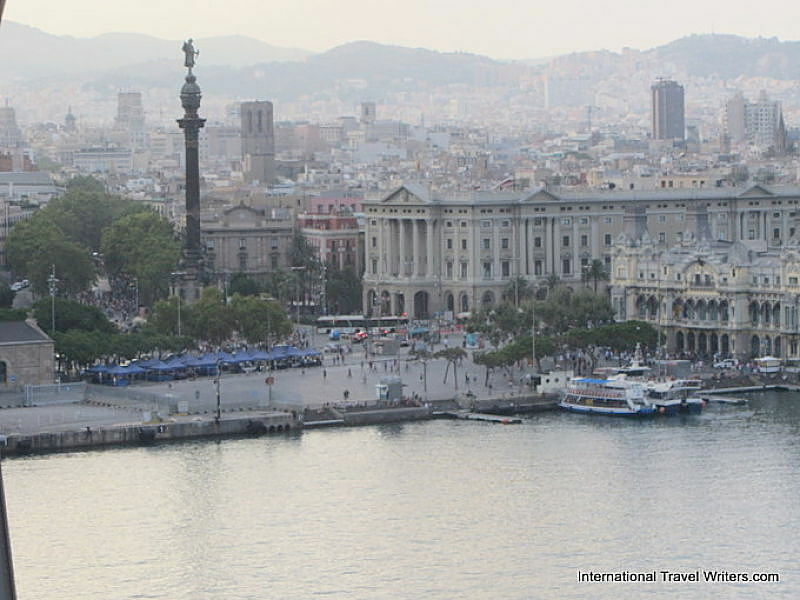 It was constructed in 1888 and serves as a reminder that Columbus reported to Queen Isabella and King Ferdinand in Barcelona after his first trip to the new continent. Port Vell Aerial Tramway crossing the old harbor and connecting Montjuic starts at Miramar station half way down the hill on Montjuic, passes through the peak of Torre Jaume I (sits in front of the Grand Marina Hotel) and ends at the top of Torre Sant Sebastia from where an elevator descends to the streets of Barcelona. 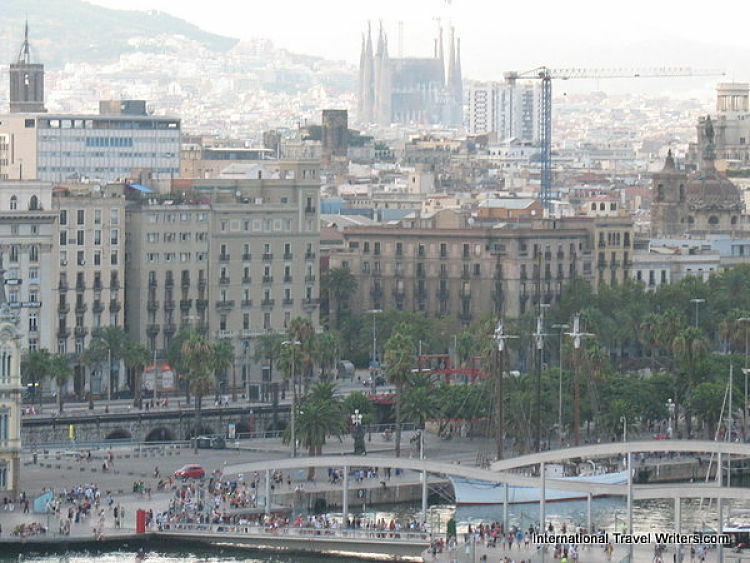 The ride offers views of the city, the nearby Placa del Portal de la Pau with the Columbus Monument, Port Vell with its Balearic ferries, the World Trade Center and Barceloneta with its beaches. 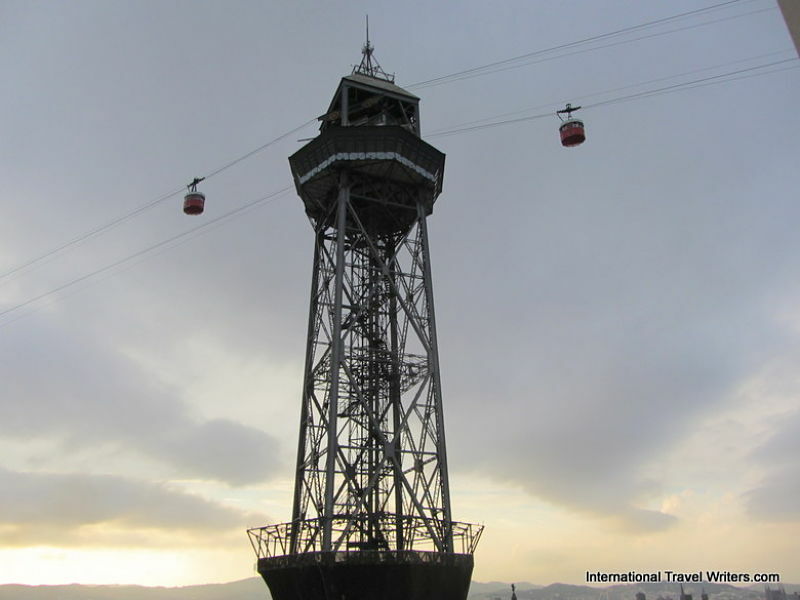 The tramway was intended to be in operation for the 1929 Barcelona International Exposition, a World's fair but it didn't open until 1931. With the Spanish Civil War and the Great Depression it ended up being a machine gun post and a look-out tower. It rusted and fell into disrepair. 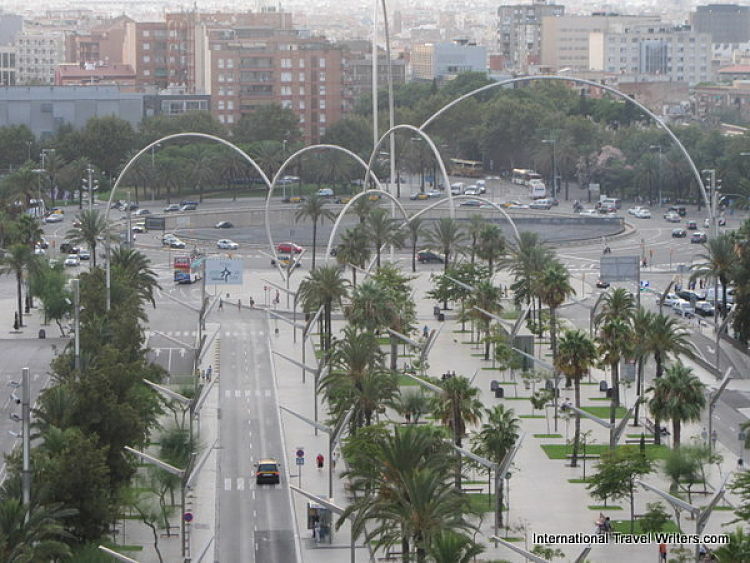 In 1996 it was included in the redevelopment plans of Port Vell so it reopened with honor in 2000. Torre Agbar is a 38 story tower which marks the gateway to the technological district of Barcelona. It was officially opened in 2005 by King Juan Carlos. 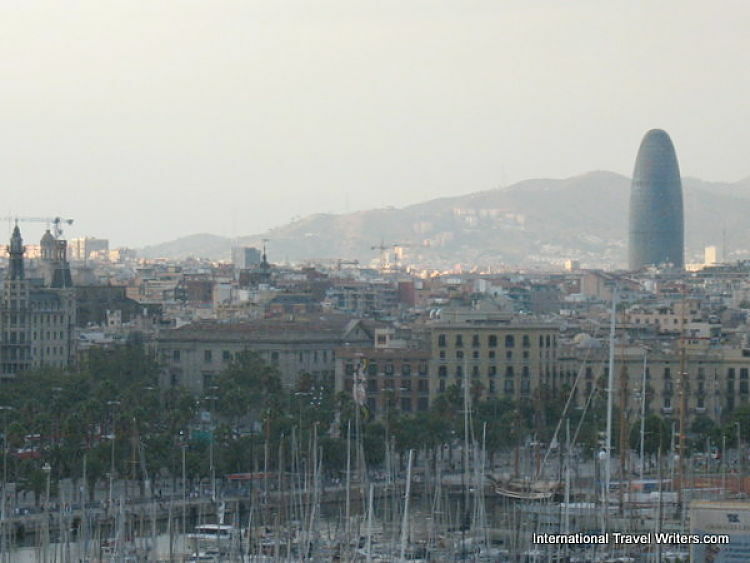 The "bullet" shape was inspired by Montserrat, a nearby mountain, although it resembles "The Gherkin" in London. It has special lighting capabilities so it is used to welcome in the New Year with colorful designs. At first controversial for it's shape, it is now a part of the landscape. Since the Grand Marina Hotel is located in the World Trade Center complex as well as Port Vell it is encompassed by large metal arches resembling the Olympic circles. These are at the exit from the complex leading to La Rambla and the Columbus Monument just across the street. 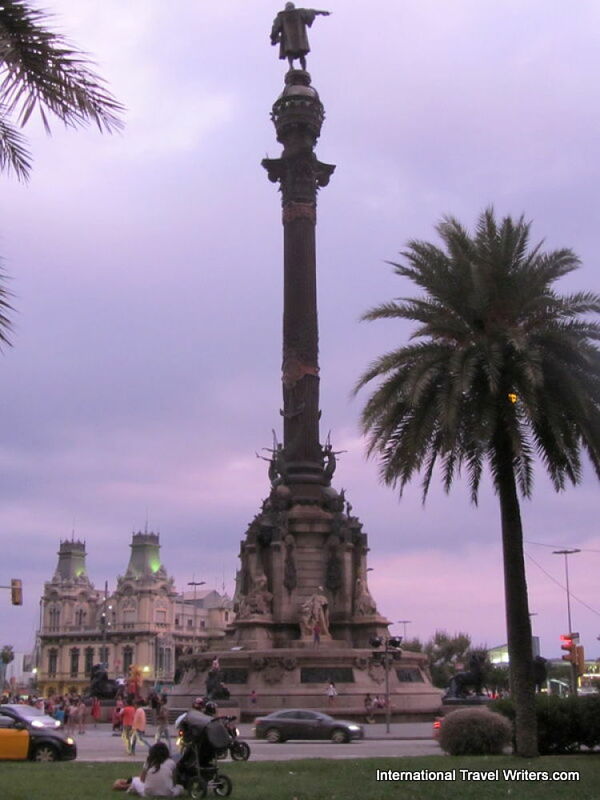 The Colon building (361 feet) also in the Plaza de Colon near the Columbus Monument was the tallest building in Barcelona when it was completed, even surpassing the height of Torre Jaume I. 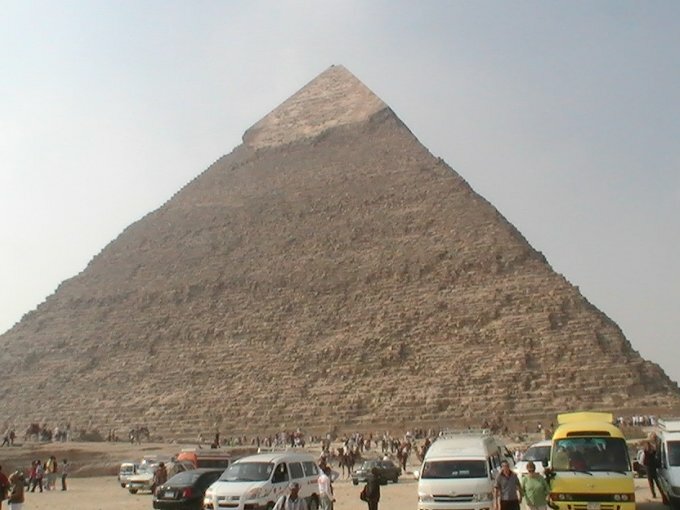 However, it was outsized by Villa Olimpica towers (505 feet) in 1992 and others since. 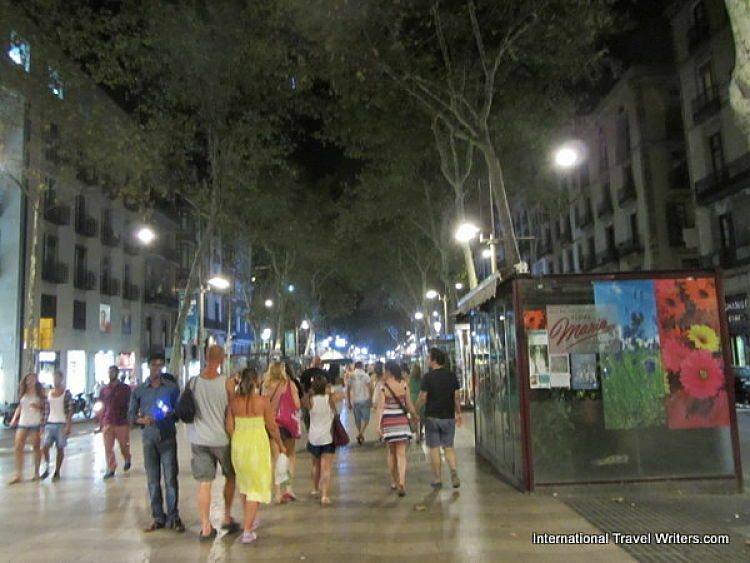 La Rambla is a tree-lined pedestrian mall (the first trees were planted in 1703) that stretches three quarters of a mile from the Gothic Quarter to the El Raval neighborhood, close to the port. It is actually a collection of a series of short streets so it's often called Las Ramblas. 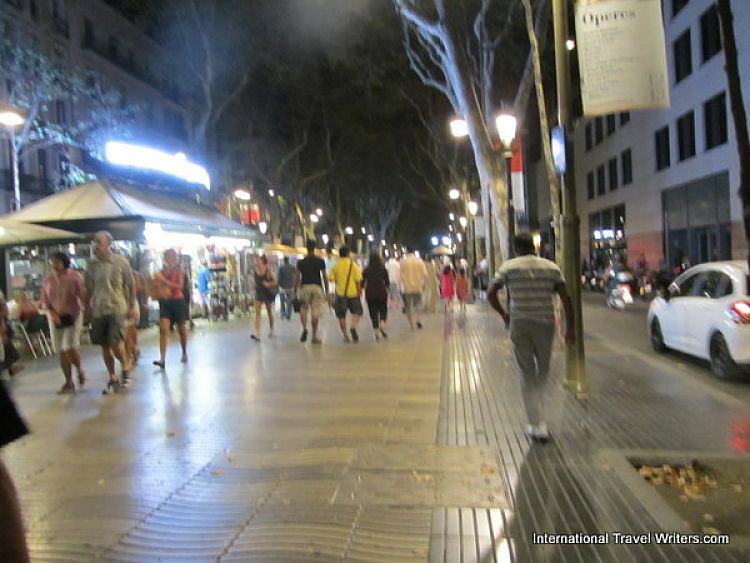 Literally, rambla means intermittent watercourse and the street gets its name from the undulating design on the pavement and a mosaic by Joan Miro. 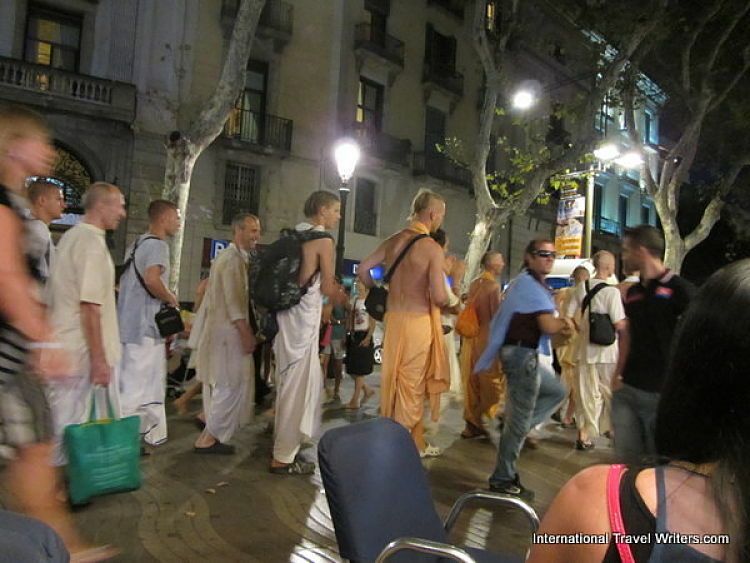 On one of our evenings the Hari Krishna group was parading down the avenue with tambourines jingling. The area is known for musicians playing but this was an amusing difference that we observed while sipping a cava and munching on a plate of delicious jamon Serrano. Be warned, prices are inflated in this area and you have to get off the boulevard to find good food that is more reasonably priced. There are shops lining the wide center boulevard with car traffic in single lanes on each side, and more shops beyond the car lanes. Kiosks line the area that sell newspapers, tobacco, chewing gum, post cards, mugs, hand-made candles, pastries, chocolates and assorted souvenirs alongside flower stalls with colorful offerings. 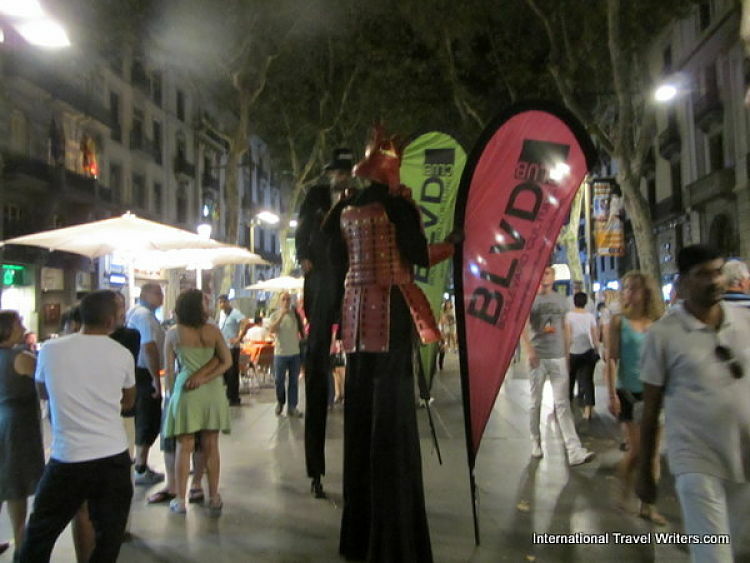 La Rambla is a fun area to people watch. Mimes stand dressed up in costumes like human statues making a living getting tips from tourists that have their photos taken with them. There are (overpriced) sidewalk cafes serving full meals, pizza, snacks, tapas bars or just beverages. Or, if you want to go on a morning shopping expedition at Boqueria market, dating back to the early 18th century, you can have hundreds of stalls to browse. When we boarded our ship the next day there was in intriguing sight passing us. 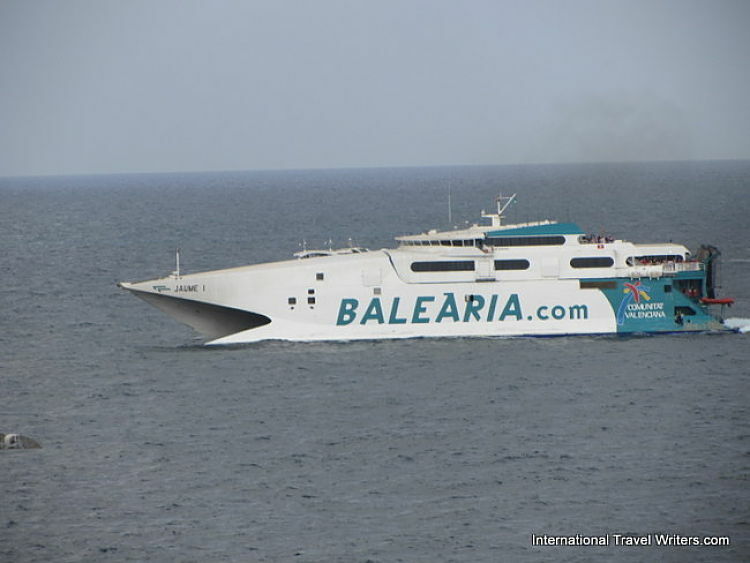 It was an imaginative paint-job displayed on one of Balearia's ferries. We had to look closely but you can see they've simulated the jaws of a shark. 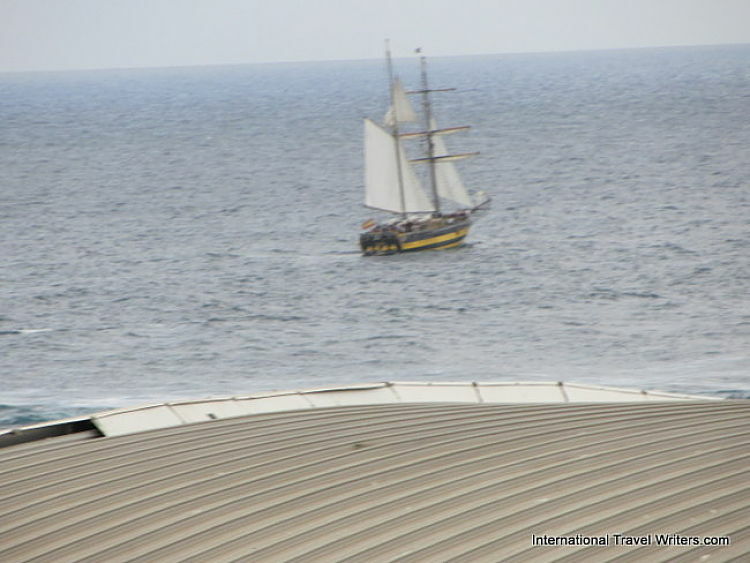 Another interesting craft that could be seen from the ship was the a two-masted schooner that at first glance looked like an old sailing vessel. From our balcony we spotted an unusual setting of the sun. Through the clouds there were rays of light flowing down in beams as if there were spotlights in the sky. 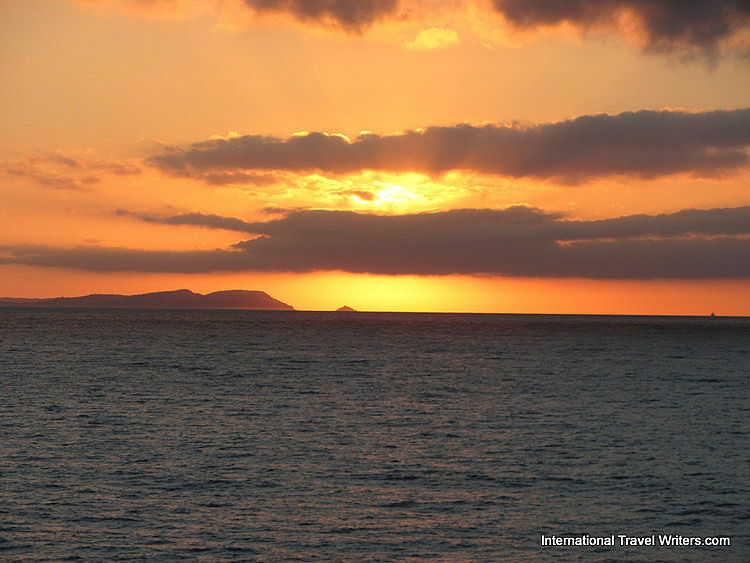 Then as we cleared land the cloud cover lessened and we had a full sunset view...gorgeous!